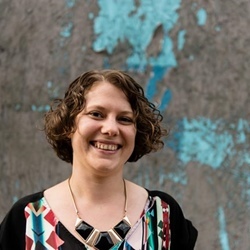 Sally Abé turns her attention to that quintessential British summertime fruit the raspberry, and uncovers an interesting story as to how they got their name. Part of the rose family, the raspberry is cultivated all over the world and believed to have originated from Eastern Asia. The Latin name of the raspberry is Rubus idaeus, which could be for two reasons: either raspberries were first cultivated on Mount Ida in Greece, or because raspberries are mentioned Greek mythology. According to the tale, Zeus’ nurse – a nymph called Ida – wanted to give him a raspberry to cheer him up. In doing so she pricked her finger on the thorns, making them eternally red. Rubus idaeus translates to ‘bramble bush of Ida’. 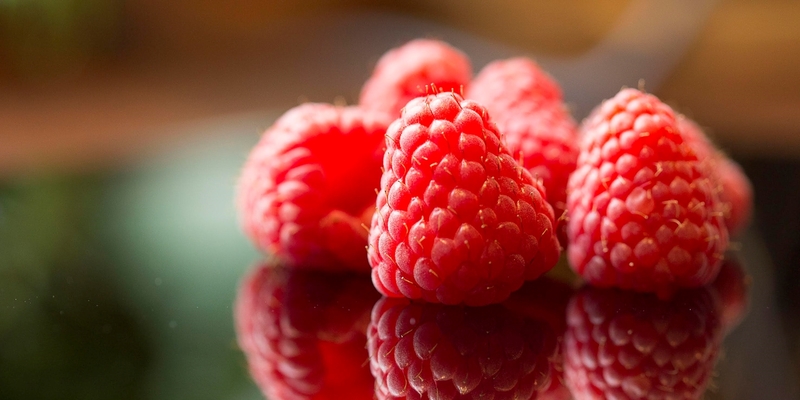 In the UK, the first mention of raspberries is in a herbal medicine book dated 1548. They were believed to have medicinal properties and carry kindness through the body. Raspberries carrying kindness through people may be a little far-fetched, but we do now know that they are high in Vitamin C, potassium, antioxidants and are a good source of dietary fibre as well as tasting delicious. There are over 200 varieties of raspberry, all of which have varying degrees of sweet, tart and candy-like flavours. This makes them the perfect match for other sweet ingredients such as dark chocolate, strawberries, mangoes, peaches, apricots, lychee and elderflower. 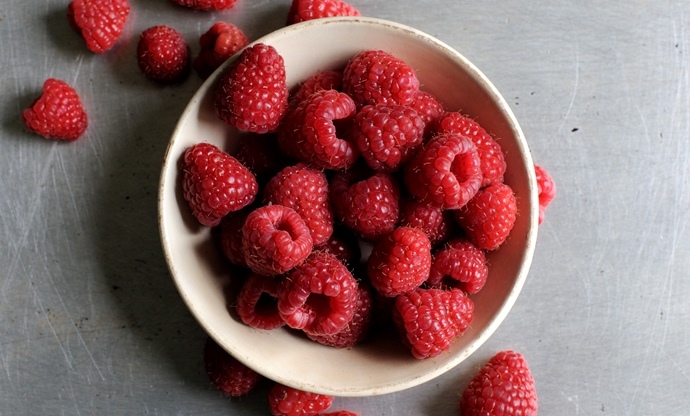 The tangy, tart taste of raspberries is another reason why they’re so popular. Herbs and spices such as mint, tarragon, cinnamon, basil, cardamom and lemon balm all bring out the flavour of the berry even more. Elderflower and raspberry are two flavours that perfectly encapsulate the British summer, and Geoffrey Smeddle’s Summer fruits in Elderflower jelly with elderflower curd is a fantastic dish which displays the two ingredients in the most beautiful way possible. Graham Campbell goes classic British with his Raspberry, elderflower and Muscat trifle, presenting the family favourite in individual pots. For a real showstopping desert, try Tony Fleming’s Buttermilk panna cotta, lychee, raspberry and rose, which shows just how well raspberry pairs with lychee and rose. The term ‘blowing a raspberry’ which refers to a noise being made comes from the cockney rhyming slang ‘raspberry tart’ (we’ll let you figure out the rhyme). Scotland is one of the largest raspberry producers in the world and the steam train that used to bring them into England was named the Raspberry Special. Raspberries also come in black and golden colours, the golden being the sweetest.